Ah yes, the exotic, unfamiliar hamburger. Wait, what? We have a tendency to think about ‘exotic’ foods from distant lands only from our own perspective. Sushi was unimaginably bizarre to the average North American only a few decades ago, but the notion gained a foothold in our collective consciousness and swept the culinary scene. Now sushi is nearly ubiquitous, albeit in a form that has often been modified in some way to suit the Western palate. But this phenomenon is not a one-way street. When Japan was convinced (or coerced) into opening its doors to the West in 1853, the nation was inundated with new clothes, habits, customs, and of course, foods. Japan had become a more-or-less pescetarian nation by this time, and aspects of Western cuisine (like the consumption of meat and the use of knives at the table) seemed utterly barbaric to its people. But the line between revulsion and curiosity is a very thin one, and yoshoku (Western food) began to catch on. The tide really shifted in 1872, when Emperor Meiji did something that shocked his subjects: he ate meat in public. This might seem inconsequential in our modern era, especially given our politicians’ propensity for seeking out average-joe photo ops in greasy spoons, but when the Emperor did it he was breaking a tradition that had lasted for a thousand years. Japanese attitudes towards Western food and meat began to shift. That same year, Tokyo’s first Western Style Restaurant, Seiyo-ken, opened for business. The popularity of yoshoku grew, and new dishes began to spring from the minds of talented chefs in the capital and elsewhere. In fact, many of the foods that we think of as quintessentially Japanese have roots in imported dishes, katsu, tempura, gyoza, and okonomiyaki to name but a few. Back to hamburgers. To a nation that had maintained a strict Buddhist edict against meat for a millenium, nothing could be more foreign or exotic than a big piece of seasoned meat. But Japan had little interest in adopting Western foods wholesale – instead, it adapted these new dishes to Japanese tastes. The word wafu means ‘Japanese Style,’ and the it is used to represent a dish that has been transformed with Japanese ingredients and to reflect Japanese tastes (hambagu, as you have probably guessed, is the word hamburger transplanted into the Japanese lexicon). Fortunately for the rest of the world, wafu dishes are perfect examples of just how good fusion cuisine can be. This hamburger patty is a revelation. The combination of pork and beef keeps the burger juicy and flavourful, and the ponzu permeates it to add a salty-sweet, tangy taste to every bite. Even the condiments get in on the act – you can, of course, top your burger with whatever you like, but the fresh, peppery punch of grated daikon, and the hot-sweet mixture of Japanese mustard and mayo partner perfectly with the patty. 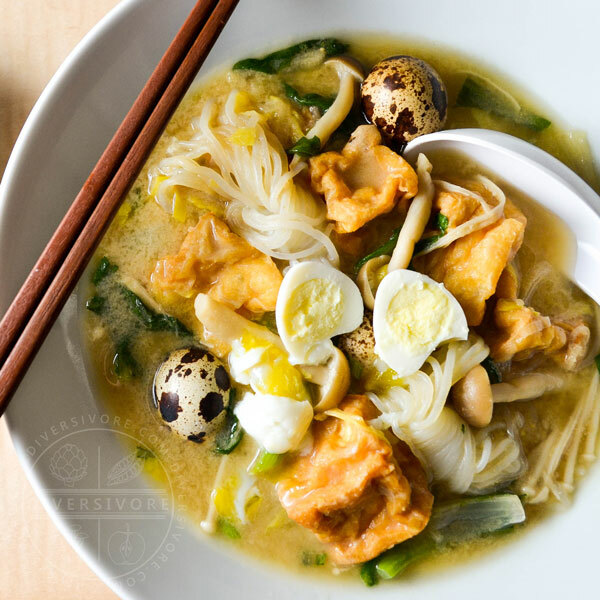 As one last added bonus, this meal demonstrates just how easy it is to extend the Japanese pantry and make it part of your regular cooking routine. There’s no reason that you can’t take the ponzu, or the condiments, or the patty itself, and adapt them to any number of meals. The patty itself is adapted with a few modifications from a recipe found here, at the wonderful Japanese food blog “Just One Cookbook.” I’m a big fan of her recipes, and I encourage you to explore the site. The key to getting really good flavour from the patty is to use both ground pork and ground beef. Beef alone won’t have the same flavour and it will make a drier hamburger. Beyond that, it’s a super-simple dish to put together. Make sure to make the patties fairly thick. I also recommend that you try to find panko, rather than regular bread crumbs, as the final texture will be better. You can use a store-bought ponzu sauce, but if you can get kombu and katsuobushi (or a good instant dashi), I strongly recommend you make your own. The taste of homemade ponzu is incomparable, and it’s really easy to make. Check out my recipe here. Daikon oroshi is a simple, one-ingredient condiment, and a very popular one in Japan. All you need to do is grate daikon (the big, long, white radish, also known lo-bok, luo-bo, mooli, etc. ), then squeeze out the juice. There’s a lot of juice in daikon, so you need to grate a fair bit to end up with a nice solid ball of daikon oroshi. In terms of taste, picture a sweet, very peppery radish. If you use the stem-end of the daikon, the flesh tends to be a little sweeter. As for grating the daikon, if you can get a Japanese oroshigane, you’ll get the best results. That being said, a nice fine-toothed grater or microplane will do a decent job too. Most of us have mustard and mayonnaise kicking around, so you’d be forgiven for just using standard Western staples. That being said, I think it’s worth seeking out the Japanese versions. They’re easily found at any Japanese grocery store and most Asian grocery stores, and they do have a distinctive taste. For starters, the mustard (karashi) is distinctly hot – closer to English mustard than sweet American mustard. As for the mayo, I just think that Japanese mayo (aka kewpie mayo) is a superior product. It’s made with egg yolks only, so it’s creamier and richer, and it’s packs a sweet/savoury punch that you really can’t beat. I didn’t really measure the mixture of the two ingredients – just mix mustard powder into some mayo and taste it to see what balance you like. I topped my burger with scallions and a little avocado. The avocado is especially nice because it works against the acid bite of the ponzu, but feel free to explore and come up with your own toppings. GOOD NEWS:Unsurprisingly, it’s loaded with protein. No bun, so it’s very low in carbohydrates. Heck, if you can come up with a good substitute for the panko, you could even make it wheat-free. Note also that the nutritional info shown is for the “serves 6” version, rather than the smaller “serves 8” patties, so that’s a plus. BAD NEWS:Well, it’s a burger, so… lots of red meat (saturated fat) and salt (mainly from the ponzu). Have lots of veggies with this one so you’re not tempted to eat 3 in one go. Heat the olive oil in a large pan over medium heat. Add the onions and garlic and saute until the onions are golden, then set aside to cool. Mix the water, sesame oil, and panko in a large bowl. You're going to add all the other ingredients to this bowl, so make sure to use something big enough. Combine all the remaining patty ingredients (not the ponzu or the vegetable oil) and mix thoroughly. Divide the meat into 6 or 8 portions, depending on how many people you're feeding and how big you want the patties to be. Cover your hands with a little olive oil to prevent the mixture from sticking to you. Form each portion of hambagu mixture into a tight ball in your hands. Roll the ball and toss it back and forth in your hands for 30 seconds or so in order to force air out of the mixture. Squash each ball into a patty, but be sure not to make it as flat as a Western-style burger. Use your thumb to make an indentation in each of the patties. The burger should be fairly thick throughout. Set the formed patties aside on a plate and cover with plastic wrap. Set the patties aside for 30 minutes (if it's warm in your kitchen you should refrigerate the meat, but make sure to bring it back to room temperature before cooking). While the patties are sitting, prepare ponzu (if making one from scratch) and condiments. Heat the vegetable oil in a very large frying pan (I like to use cast iron, but nonstick will work too) over medium heat. Add the patties to the pan, taking care not to crowd them together. Brown the patties for about 4 minutes - don't move them until they're ready to flip. Flip the patties over and cover the pan to to cook the other side. Let them cook for about 5 minutes, at which point the patties should be cooked most of the way through. Remove the lid and increase the heat to medium-high. Pour the ponzu over the hamburgers and continue to cook for an additional 2 minutes, spooning the sauce over the patties during this time. Remove the burgers from the pan and place them on a plate to rest. (Optional) Increase the heat in the pan to high and cook the remaining sauce until it's reduced by one-third to one-half. Serve the reduced sauce over the burgers or on the side. If you find the sauce too salty, add a tablespoon of mirin. To make grated daikon (daikon oroshi), ideally you'll want to have an oroshigane (Japanese fine-toothed grater). Simply cut and peel a small section of daikon, then rub the cut face in circles over the oroshigane to make a fine puree. Place the grated daikon in a small piece of cheesecloth and squeeze out the excess moisture. If you don't have an oroshigane, use the finest grater that you can find and follow the same steps. To make the Japanese mustard/mayo, simply mix the mayonnaise and the karashi mustard powder together in a small bowl and serve on the side or over the burger. Be warned, the mustard tends to pack a spicy punch. Note: ponzu sauce is not difficult to make, but it will be at it's best if you can make it ahead of time. If you make it from scratch while you cook the rest of this dish, it will still be wonderful, but it will be even better (and easier) if you make it the day before. Ideally, ponzu should be made with yuzu citrus instead of lemon, but this can be exceptionally difficult to get a hold of. On top of that, yuzu tends to have much less juice than lemons do, so getting enough juice can be tricky. If you can get yuzu, get as much juice as you can, then make up the rest with fresh lemon juice. You can also buy good ponzu sauces from Japanese grocery stores -- choose a high quality, unfiltered brand for the best taste. Try to avoid overly sugary varieties -- many have more water and sugar as the first two ingredients, and these will yield an overly sweet sauce. It’s a great name, but I can’t take any credit. It’s pure Japanese, believe it or not. Japan has a rich history of borrowing food words and modifying them to make them pronounceable in Japanese. Hamburger = hambagu, croquette = korokke, cutlet = katsuretu (which becomes katsu), etc. Though my absolute favorite borrowed word isn’t a food word at all, but the word ‘helicopter,’ which is herikoputa in Japanese. Wow, such a great and informative article. I had no idea about the pescaterian culture and eating meat in public for the first time. My mother in law is Japanese so it’s always nice to learn more about that culture. Thanks for sharing! This looks AMAZING! I love Japanese food and its great that so many of the raw ingredients are available to us Westerners now!